Guidelines for Editorial Submissions page. war·ran·ty: A guarantee given to the purchaser by a company stating that a product is reliable and free from known defects and that the seller will, without charge, repair or replace defective parts within a given time limit and under certain conditions. Warranties ... on one side of the coin, they exist as a concrete way of protecting the consumer from malfunctions, resolving defective products or performing general maintenance. On the other side of that shiny quarter is the fact that they are a business revenue model for companies to sell more for things that may never be needed or to customers that are likely to misplace the information and never take advantage of it. Either way, it's an integral part of the customer service experience. Just recently, I purchased a new minivan for my family -- a necessary piece for transporting my 11-month old son and all of the "stuff" we take along with us now wherever we go. At the last stage of the process, they offered an extended warranty. They said "all you'd need to do is give us your name and address to access your information and service the vehicle." Hmmm ... I thought there had to be a better way, whether for warranties and services with cars, electronics or anything else. The better way has arrived. It is known as radio-frequency identification, commonly referred to as RFID. Industry heavyweights have begun to actively explore this technology for applications ranging from supply chain management to warranty and reverse logistics initiatives. Companies are now searching for new ways to effectively service and up-sell customers, while experimenting with processes for cutting operational costs. From electronics firms such as Sony Corp. to global one-stop-shops such as Wal-Mart Stores Inc., the new challenges of the global economy have Fortune 500 and early-stage organizations inspecting golden applications. "RFID is a generic term for technologies that use radio waves to automatically identify individual items. There are several methods of identifying objects using RFID, but the most common is to store a serial number that identifies a product, and perhaps other information, on a microchip that is attached to an antenna (the chip and the antenna together are called an RFID transponder or an RFID tag). The antenna enables the chip to transmit the identification information to a reader. The reader converts the radio waves returned from the RFID tag into a form that can then be passed on to computers that can make use of it." Now that there's a foundation for the technology behind RFID, what is the significance of RFID-based services? 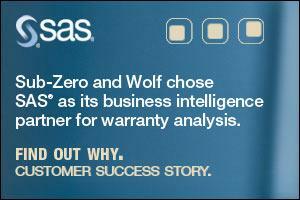 Simply, improving the warranty experience builds customer loyalty and streamlines cost efficiencies. Alan Kay, one of the inventors of the Smalltalk programming language and perhaps the biggest influence on both the Apple Macintosh and Microsoft Windows operating systems with their graphical user interface (GUI), is famous for his significant contributions to technology. Whether crafting the foundation of object oriented programming or developing industry-transforming ideas at Xerox's Palo Alto Research Center, his innovative thinking focused on enabling people through the utilization of technology in everyday life. Perhaps one of the most relevant statements he made that can be applied to radio-frequency identification and warranties was, "The best way to predict the future is to invent it." While many are still evaluating RFID in their business plans, this technology is re-inventing how the future of business and customer service will progress. After all, as the visionary behind the laptop, Kay could probably benefit from an RFID-enabled warranty for the computer sitting on his desk today. The Internet revolution was about people connecting with people. The next revolution will be about things connecting with other things. This transformation will occur through small, intelligent identification technologies that possess data to track, locate and return anything to anyone, anywhere at anytime. Many visionaries have been focusing on these efforts and include research and industry support from MIT's Auto-ID Center, Silent Commerce efforts from leading consulting firms such as Accenture and innovative solutions such as RFID-based Return ID Stamps from Intellareturn Corp.
As highlighted, a warranty is a guarantee stating that a product is reliable and free from known defects and that the seller will, without charge, repair or replace defective parts. Logistics, especially reverse processes, has become an operational nightmare for many organizations. Whether through warranties or money-back guarantees of satisfaction, companies need to surpass expectations to enhance customer loyalty. Furthermore, they need to effectively provide services that allow for new revenue opportunities without pushing expenses. It's a challenging balancing act for many professionals in the business environment. In recent months, many have explored the benefits promised by radio-frequency identification. Solutions are being developed each day by new early-stage entities and even industry behemoths such as Microsoft Corp. By incorporating RFID into warranty, lost-and-found, and reverse logistics, it forges a closer relationship between companies and the valuable consumers they interact with. Aligning new service offerings through players in the parcel shipping industry and product companies, superior customer service becomes an all-important competitive advantage. Many companies strive to offer enhanced customer service. RFID may be the catalyst for this transition. Remember the minivan? According to the RFID: Emerging Applications Driving R&D Investment and End-User Demand study released by technology research firm Allied Business Intelligence (ABI), "automotive applications represent 46% of the total market today ... and key applications of RFID technology in vehicles include immobilizers, automatic vehicle identification, tire tracking, and passive entry systems." With this traction, warranty efforts are soon to follow given that they are a $9 billion activity for vehicle manufacturers. According to Scott Lundstrom, AMR Research's Senior Vice President and Chief Technology Officer, RFID will be bigger than Y2K. AMR's in-depth report illustrates how "RFID will have a dramatic impact on the operation of global supply chains over the next 10 years, and while widespread adoption is 5 years away, world-class supply chain companies are starting to pilot RFID now." Accenture recently conducted a variety of studies on Auto-ID technologies, describing how they can "dramatically improve production operations, asset utilization, forecasting and inventory accuracy and, ultimately, customer satisfaction." From warranty to inventory efforts, these initiatives are poised for a significant role in every business. "Products that interact with customers, products that monitor themselves ... these kinds of Silent Commerce capabilities get the attention of boardroom executives today." One of the killer applications with RFID that provides extraordinary value to the company and customer is warranty and return logistics. Both large enterprise companies and entrepreneurial start-up organizations are crafting solutions that maintain and enhance the total lifetime value of a customer. Incorporating technology like RFID allows companies to expand customer service offerings that reinforce business objectives. New York-based Intellareturn provides RFID smart label applications that leverage product registration, return shipping and warranty service touch-points aimed at optimizing the current supplier and customer relationship technologies investments. Essentially, Intellareturn links advanced ID technologies for powerful new logistics applications. 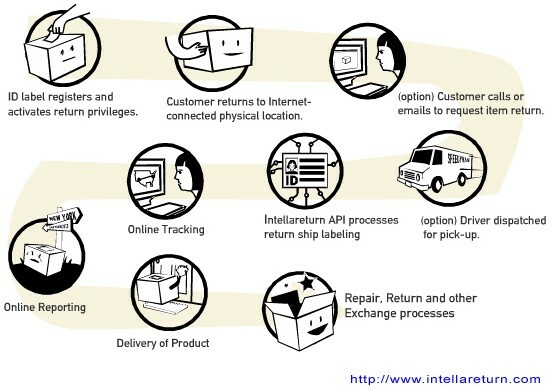 The Intellareturn Smart Return Service easily integrates with all existing legacy shipping solutions, such as the FedEx Return Manager API, as a technology-agnostic approach to enhancing customer support infrastructure. But how would it work? A customer would go online to register a product and enter personal information, activating the Intellareturn process. If the product was lost, it could be identified by its tag and returned via one of the major parcel carriers. If the product needed to be repaired, the customer could go online, enter information at the manufacturer�s Web site and a parcel service would pick it up. Simplicity. The consumer doesn't need to fill out a shipping label. When the driver arrives, he scans the tag and uses the ID number to retrieve all the information he needs from the Intellareturn Smart Return Service database. The manufacturer could offer this as an additional service that customers may be willing to pay for. The parcel companies could generate extra business from handling the returns. "But my products and warranties have barcodes, so I don't need RFID." Advances in miniaturized electronics, nanotechnology and ongoing research at the MIT Auto-ID Center are developing intelligent ID devices into highly sophisticated smart labels for applications in reverse logistics and customer identification for post-sales warranty support. The benefits are far more than tracking mechanisms. The value proposition stems from new services that organizations can offer, wrapped around their actual products. It's a quantum leap in the relationship with customers, not just a better barcode. And what�s wrong with just continuing to use barcodes anyway? While barcodes are and will continue to be an industry standard for some time, they are a "line-of-sight" technology. The value that RFID brings to its forerunners �- barcode technology and magnetic strip swipe cards �- is that of cost and speed. Essentially, any location that now uses barcodes in their return solution can achieve new benefits from RFID and solutions like that of Intellareturn. A recent report conducted by IBM Consulting Services for the Auto ID Center uncovered some rather interesting findings. A Rogers and Tibben-Lembke study of the consumer electronics industry analyzed the major problems for returns management in the consumer electronics industry. They learned that the costs of reverse logistics negatively impact profits for the computer and electronics industries by as much as 25%. Given that nine out of ten consumers don't bother filling out the product registration postcards, utilizing solutions like RFID can reduce or eliminate many of the inefficiencies associated with reverse logistics, supporting customer relationships with after-sales applications like warranty and return efforts. In the case of a solution provider such as Intellareturn, a consumer electronics company such as Sony or Nikon could embed an Intellareturn RFID tag on a purchased product. If a customer agrees to buy an extended warranty, Sony or Nikon could offer to automatically pick up the product if it needs to be serviced or have it returned for free if it is lost or stolen. Are Privacy Concerns Greater than the Benefits? Many opponents of the RFID arena have been touting the privacy card. While any initiative that utilizes information and holds this in a database can be risky, there's no more to worry about than the various identity pieces used today: credit and debit cards, highway toll technologies, Internet registration efforts or numerous other venues. Like anything, the value of a new technology, product or service can also transform into a concern in the wrong hands. However, like the Internet, people have shown that they can give up a little bit of privacy and information for added convenience. The industry's leading proponent, MIT's Auto-ID Center, is continuously working with corporate and university partners to establish guidelines and standards to enhance adoption. To protect the benefits and advances of RFID implementation, researchers at RSA Security have developed a solution to eliminate many of the privacy concerns. According to an eWeek article, the solution focuses on fooling radio-frequency identification readers with a blocker tag as an effective answer to many of the privacy and security questions surrounding RFID technology. Since RFID readers can't talk to more than one tag at a time, these tags could be programmed to block only a certain range of RFID serial numbers. "This is a brilliant idea. I'd like to see one of these blocking tags attached to my wallet or car keys so that all RFIDs would be blocked," said Avi Rubin, associate professor and technical director of the Information Security Institute at Johns Hopkins University, in Baltimore. Some industry followers still debate whether there is a need for RFID at the supply chain, warehouse, store or product levels. While benefits like warranties already exist, corporate policies to establish these guarantees are the simple part. The tough situation arises when there's no system in place for maintenance, logistics and overall implementation of the warranty process. Establishing the warranty is easy -- it's how you support this for your customers afterwards that is the challenging part. Mitsubishi Motors replaces North American CEO Pierre Gagnon with Hyundai Motors president Finbarr O'Neill, who pushed the quality improvements and longer warranties credited for 400% sales boost since 1998. La Curacao, Perus leading retailer of appliances and computer products, selects Warrantech International to administer extended warranty program. AVB/Brand Source launches Expert Protection, an extended warranty program backed by Service Net, and plans an in-store training program for consumer electronics salespeople. Runco International lengthens warranty on projectors to two years and on plasma screen electronics to three years. Looking for cash? 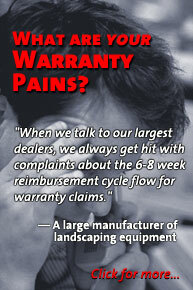 Warranty management is a good place to start. The bottom line: Invest in automation and integration for the warranty management process to free up cash and start creating new business opportunities. Lawyers in the United States are appealing a Nebraska bankruptcy court decision protecting National Warranty Insurance Risk Retention Group's liquidation in the Cayman Islands, and are hurling insults as well as legal briefs at each other. Syncata Corp. survey finds 85% of vehicle manufacturers prepared to meet TREAD Act compliance deadlines, but 40% of suppliers, grappling with changing requirements, are "not at all" or only "somewhat" prepared. As warranty work in dealerships decline, GM and Chrysler are working to help dealers enhance their service businesses. Active Web Services is selected by Big Dog Motorcycles for warranty processing, TREAD reporting and service parts management. Hewlett-Packard Co. introduces low-priced iPaq h1935 handheld computer with only 90-day warranty. AnchorDesk editorial director Patrick Houston likes HP Media Center PC 873n and Dell Inspiron 5100 as best back-to-school choices for college students. The Today Show's Lou Manfredini explains why asphalt-shingled roofs need replacing long before the warranty on the shingles runs out. Aon Warranty Group names Michael F. Frosch president of Aon Home Warranty Services. Investigators searching for the cause of massive blackout affecting 60 million people narrow focus to transmission lines in Cleveland area. Major economic costs of blackout include spoiled food and lost wages, but automotive factories will make up for lost production, and a surge in capital spending for infrastructure upgrades and backup power sources is predicted. The increasing importance of reverse logistics in technology companies. Who Are You? Warranty Week editor asks readers to identify themselves and their places of business, and tabulates the results. ServiceBench Signs HomeServe: When it came time to upgrade its field service management system, the home warranty company turned to Asurion's ServiceBench unit for a cloud-based service platform that could connect its customers, contractors, and service center team, helping them to make sure that the right contractor is assigned for the job and that they show up at the appointed time.